The Israeli military last week bombed a previously unknown variety of Hamas tunnel in the Gaza Strip, one that extended into the sea and was apparently meant to be used by the terror group’s elite naval forces to carry out attacks from the coast, the army revealed Sunday. 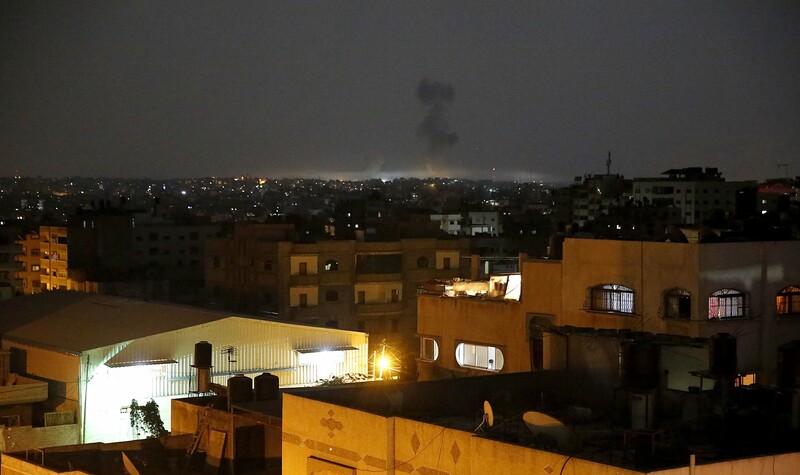 On June 3, in response to repeated rocket attacks from Gaza, the Israeli Air Force conducted a series of raids in the Palestinian enclave, striking “a military compound belonging to the naval force of the terror group Hamas in the northern Gaza Strip,” the army said at the time. On Sunday afternoon, the Israel Defense Forces revealed that the specific target of the airstrike on the compound was the naval tunnel. The Hamas base was located approximately three kilometers (1.9 miles) from the Israeli border. The tunnel in question did not cross the border into Israeli territory, but instead extended dozens of meters underwater into the sea, according to IDF spokesperson Lt. Col. Jonathan Conricus. The military believes the tunnel was meant to allow frogmen from Hamas’s elite naval unit to travel from their base on the shore into the sea underground, and thus undetected. From there, they could travel underwater to their Israeli targets, Conricus told reporters in a phone briefing. “We know that it was an operational tunnel that has been used, or at least trained in, before,” he said. The officer said the army decided to reveal that it had destroyed Hamas’s “strategic” tunnel one week later in order to “be clear what the consequences were” for rocket attacks. “The IDF will not allow Hamas to strike Israeli targets, military or civilian, from the sea,” Conricus said. The tunnel was discovered after “extensive intelligence work, both by naval intelligence and Military Intelligence,” he said. He said it was a “possibility” that Hamas has more such tunnels. “We continue to monitor [the area] using all of the operational, technological and intelligence capabilities at our disposal,” he said. On May 27, the Defense Ministry announced that work had begun on a marine barrier to help prevent terror attacks from the sea. 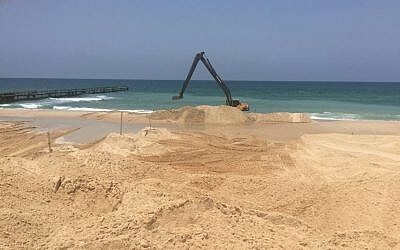 The naval wall, described by the ministry as an “impregnable breakwater,” will extend some 200 meters (660 feet) out to sea and will serve as an additional hurdle for Hamas frogmen seeking to infiltrate into Israeli territory, as occurred during the 2014 Gaza war. 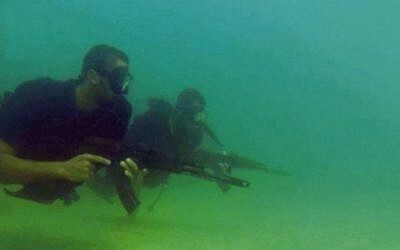 On July 8, 2014, Hamas sent four naval commandos into Israeli territory, outside Kibbutz Zikim on the southern coast. The Israeli military has long believed that Hamas is expanding its naval capabilities, both in terms of advanced technology and in training frogmen to infiltrate into Israeli territory from the sea and to attack Israeli vessels. Late last month, in response to a large mortar and rocket attack by terrorist groups from Gaza, the Israeli military targeted other key Hamas naval capabilities, the army had said. On May 29 and 30, Hamas, the Palestinian Islamic Jihad and other assorted terror groups in the Gaza Strip fired scores of mortar shells and rockets at southern Israel over the course of 22 hours. The army said more than 100 of the projectiles fired were on a trajectory to hit Israel, while many more were apparently launched but failed to clear the border. In response to the attack — the largest since the 2014 Gaza war — the Israeli Air Force bombed at least 65 targets in the Strip, including a naval armory containing “advanced maritime weaponry capable of naval infiltration and carrying out terror attacks by Hamas naval forces,” the army said.